BELIZE CITY, Mon. 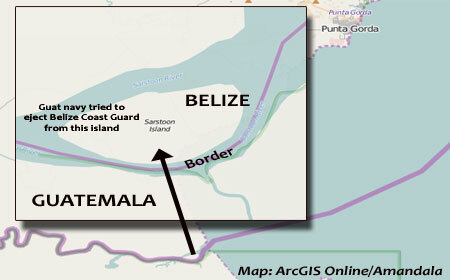 May 30, 2016–In the wake of bilateral talks between the Belize Government and the Republic of Guatemala that were held halfway around the world in Istanbul, Turkey, Guatemala has not relinquished its claim of sovereignty over the Belize side of the Sarstoon River, which has become the flashpoint of Guatemala’s unfounded claim against Belize. Today, the Opposition People’s United Party (PUP) issued a press release which demands that the Dean Barrow-led United Democratic Party Government act to restore Belizean sovereignty over the Sarstoon River and Sarstoon Island. Last Friday, representatives from KREMANDALA and Channel 5 News were prevented from traveling in the Sarstoon River by Guatemalan Armed Forces, who told the media representatives that they were in Guatemalan national waters and asked them to leave immediately. “The prevention by Guatemalan naval forces of members of the Belizean media from free passage to and through the Sarstoon River on Friday, 27 May 2016, and the brazen presence of Guatemalan forces in Belizean internal waters is illegal and a blatant violation of Belizean sovereignty,” the PUP release added. “This latest incident is evidence of Guatemalan bad faith which erodes the very limited progress achieved at the bilateral meeting between Belize and Guatemala held in Istanbul, Turkey on 23 May. Belize needs to adopt a more aggressive and urgent approach to the Sarstoon problem in order to guarantee full Belizean sovereignty and territorial integrity,” the release further stated. “The PUP therefore calls for the Belizean Government to act as follows: 1. To adopt a comprehensive plan to restore full Belizean sovereignty and control over the Belizean internal waters of the Sarstoon River and of Sarstoon Island; 2. To immediately recall Ambassador Alexis Rosado for consultations; 3. To insist on a meeting between Belize and Guatemala, under the auspices of the OAS, that will result in a signed protocol guaranteeing free navigation in the Sarstoon River in accordance with the 1859 Treaty and international law; and 4. To appoint a National Team to competently manage Belize/Guatemala relations.” said the PUP release.